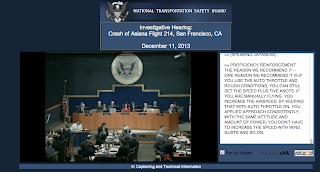 The NTSB's hearing on Asiana flight 214 began this morning and will end this evening. It is notable for its use of technology to get information quickly to the public. There is no only a live webcast, but also also a live written transcript in English combined with options for translations in Korean and Mandarin Chinese. This hearing was originally scheduled to take place over two days, but the first day was cancelled due to weather in the Washington, DC area. The agenda was revised so that it could be completed today, and the hearing will run until about 8:00 p.m. This hearing will also be archived for several months, making it very easy for the media and especially the general public to come to their own conclusions about the information provided by witnesses. 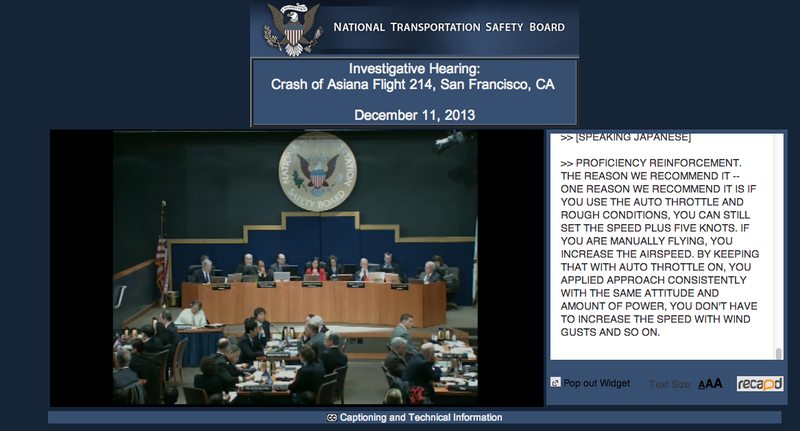 If you are searching for recent comments on Twitter, helpful hashtags include #NTSB, #Asiana, and #777. Superb allocation about this news which is getting more essential to me as well. I have been more delightful and so much exciting. Your post have done courageous me. Thanks a lo for letting this content..